What has made a new Italian eatery in Vinohrady “the place to be seen” for Prague’s business community practically overnight? For one thing, it’s got the most authentic Italian cuisine this city has ever seen. At first glance, the reasons for Aromi’s fast fame are elusive. Simple wooden furniture, a restrained decor in warm cream and dark brown shades, accented by a few paintings on the walls. But when you look at the diners from table to table, you know you’ve stepped into someplace special – well-dressed executives, well-known VIPs, and many of the city’s leading business personalities are gathered here. And each face is animated by conversation and the expressions that only come from a top-rate meal and fine wine. 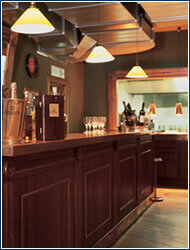 What can be different about another addition to Prague’s countless Italian restaurants? Is it even possible to come up with something new? 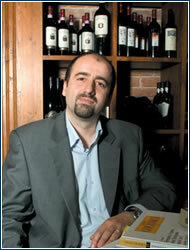 Thirty-six-year-old Italian Riccardo Lucque, who is both the owner and head chef, thinks it is. 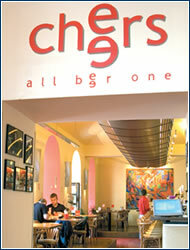 “I try to offer specialties that you won’t find elsewhere. I import everything that I can myself – prosciutto, cheeses, wines,” he says. Lucque has been pursuing gastronomy since he was 16, and has worked as head chef in many establishments in his native Italy, as well as New York and London. His hot new venue offers many products from his native region, Marche, which he says is as rich in delicacies as neighboring Tuscany, but is less well known. Aromi is also arranged differently from other venues. In its two spacious rooms you won’t find narrow tables lined up close enough to each other for you to become an unwilling eavesdropper on utter strangers. Quite the contrary. The tables for four are not only comfortably spaced, but are also spacious enough to accomodate everything your group might order. “I like people to share their food. I recommend that customers order, say, a bigger fish, and to add various types of appetizers and side dishes, so that everyone can taste whatever they want. That’s the real Italy,” Lucque observes. 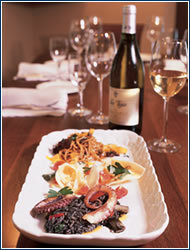 Each evening a long table laid out with all the restaurant’s fine wares becomes the center of attention. Lucque claims that his motivation was to stress the visual impact as much as the flavor of his fresh entrées. You can order anything you see, including wine and grappa, and the evening’s fresh fish are displayed from table to table. This has become an unexpected hit. “They’re the menu’s best seller, accounting for up to 70% of all orders,” Lucque says. Popular items among the bounty from the sea include a seafood sampler and, as a main course, baked turbot with seasonal vegetables or dogfish baked in sea salt. The specialties also include three types of pasta with black truffles, or T-bone steak Fiorentina, from Gianini cattle raised only in Tuscany. Interestingly, the wine list is longer than the main menu. Besides classic regions like Tuscany, Umbria, and Sicily, it features a great number of wines from the Marche region or another “forgotten” area, Abruzzo. Lucque, who moved to Prague with his Czech wife just three years ago, is trying to create a homey atmosphere in Aromi. The walls are adorned with paintings of the Tuscany countryside that are the work of his grandfather, several pieces of furniture are from his father’s furniture restoration shop, and Lucque sometimes gives guests marmalades and jams his mother has made. LIMELIGHT: Can you say “Na zdraví”? THE LUCKY COMBINATION of casual dining dishes and location has conspired to make this Prague 2 venue a favorite after-work and weekend meeting place of both Czechs and expats alike, and the nimble staff may be confronted with tables for two or groups of 20 with equal regularity. The menu runs the gamut – from burgers and goulash to sushi and chicken satay – as well as fresh salads and tasty pastas for lighter lunches. As the name implies, the requisite array of potables (beer, wine, cocktails) are available to fuel conversation, and there’s plenty of public transportation nearby for patrons whose thirst gets the better of them. If you take a trip to Český ráj, setting aside time for a visit to Dětenice is a must. Besides a beautifully refurbished castle, Středověká krčma is considered its greatest attraction. The tap room’s vaults are illuminated by plain candle light and torches, the staff wear period costumes, the rooms are equipped with sturdy oak tables and benches, and the smoke-stained walls are adorned with old tools and weapons. When a staff member asks you, “So what’ll it be for vittles, you riff-raff?” the illusion of having traveled several centuries is perfect. The “Vittles List” (menu) offers various types of meat roasted in an open fireplace, corn, and flat cakes that you eat with your fingers and wash down with Dětenice beer. 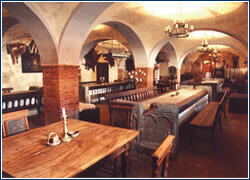 (The tavern is now part of the Dětenice brewery, which you can also tour.) Friday and Saturday evenings are enlivened by jugglers, fakirs, musicians and belly dancers. We recommend reservations.